To serve the people the way God has ordained, under the anointing, is the driving force within Pastor Joseph Hal l Jr., “Servant Extraordinaire”. 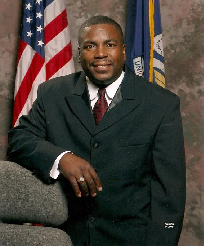 Pastor Hall was born on July 14, 1967, in Shreveport, Louisiana to the Reverend Joseph Hall Sr. and Sister Seerather Hall. He began his spiritual walk with God at an early age and accepted the call to preach in December of 1985 at the age of eighteen. In 1986, Pastor Hall became the youth Pastor of Benford Chapel Baptist Church in Tenaha, Texas. He served in this capacity until 1987 when he moved to Seattle, Washington and united with Rose Hill Missionary Baptist Church. He became Associate Pastor of Rose Hill Baptist Church in 1988. Also in 1988 Pastor Hall became interim pastor of St. Matthews Baptist Church in Seattle, where he served for one year. Pastor Hall returned to Louisiana 1990 and became the Pastor of New Zion Baptist Church in Grand Cane, Louisiana where he served for ten years. Under Pastor Hall’s leadership New Zion prospered and was able to build a new sanctuary, a new fellowship hall and purchase a van and bus for transportation. Pastor Hall accepted the pastoral of the Union Spring Church in Catuna, Louisiana in 1995. Under the leadership of Pastor Hall with the direction of the Holy Spirit, Union Spring has grown by leaps and bounds. In the sixteen years Union Spring has been under Pastor Hall’s authority, they have increased membership to over 500 members and still growing. They have added ministries such as, the Nursing Home Ministry, the Women’s Ministry, Home Bible Study and a Youth Ministry. In 1998 a ground breaking ceremony took place for the Union Spring Life Center/Restoration Center, since the completion of the Center it has been serving as a haven for the spiritual and physical needs of the people. Pastor Hall’s vision for the Center is to “Meet the Whole Need of Man “, which has become it’s motto. In September 2005, the Center served as a shelter to Hurricane Katrina evacuees, also, since Pastor Hall has such a passion for young people he Incorporated the Restoration Center in 2003 to house the Teen Pregnancy Prevention, After School For All and Summer Feeding Programs. Each program was open to all school age youth and employed about seventy-five employees throughout the year. In 2002 a new chapter was started in Pastor’s Hall life, he married the beautiful First Lady Michelle Hall. Lady Hall walks side-by-side with Pastor Hall and supports him in everything that he sets out to pursue. Pastor Hall also has a passion for the community, he currently serves on the Mansfield City Council as Alderman for District D, and serves as Chairman for the Mansfield Housing Authority, he established the Mansfield Metro, which was a public transit service that included a city bus and taxi cabs. Pastor Hall is also involved in a number of other Ministries including the Progressive Holistic Ministries, and The Greater Mansfield Ministerial Association, and as of November 27th, 2011, he was called to take on the Pastoral assignment of The First Baptist Church of Cedar Grove in Shreveport, LA. The official installation service occurred on March 18, 2012. Pastor Hall is a shepherd sent by God to lead his people to a new level in Christ. Teaching God’s word with simplicity and understanding , he helps the people to apply God’s word to their everyday lives and strive to live a life pleasing to God. He is a Pastor, a Teacher, a Friend and true Man of God.